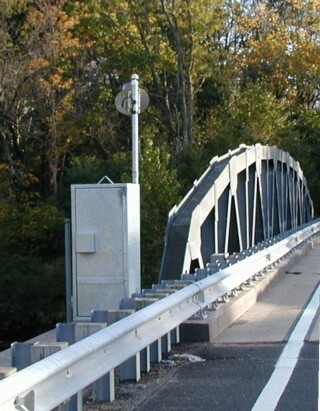 LOCATION.--Lat 40°30'07", long 74°44'33" referenced to North American Datum of 1983, Branchburg Township, Somerset County, NJ, Hydrologic Unit 02030105, on downstream left wingwall of bridge on Black Point Road, 40 ft upstream of Neshanic River, 0.7 mi southwest of Neshanic Station, and 3.2 mi southwest of Flagtown. PERIOD OF RECORD.--Continuous-record gage-height station, water years 2003 to current year. GAGE.--Water-stage recorder with telemetry and crest-stage gage. Datum of gage is 60.4 ft above NGVD of 1929. EXTREMES FOR PERIOD OF RECORD.--Maximum gage height, 22.18 ft, Aug 28, 2011.